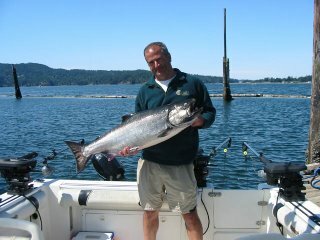 The fishing in Sooke has been quite good lately. There are big spring salmon (king salmon) coming in regularly, but the word is "patience"...you have to put in the hours and stick it out. There are lots of coho salmon (silver salmon) out in the tidelines. This is an odd numbered year, so there should be a large number of pink salmon migrating through shortly...put out some lighter tackle and have a blast fishing these scrappy fish. Gord from Foghorn Fishing Charters reports: " fishing is still abit slow this week for big springs, but there are nice fish to be had with some patience, there are some sockeye showing and pinks, here are some happy clients from this week, John & Dale from Castlegar B.C. with a 22-29lbs, and Branch from Seattle WA, with a 33lbs. 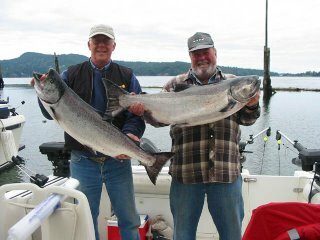 These salmon were caught at Possession Point at 55 to 95 feet with medium anchovy, Ryhs Davis 602 head with a white glow flasher. Watch out for the weeds!" Ryan from Fresh Fishin' Charters adds "we got a 35 pound chinook salmon this week at Sheringham Point as the ebb was slowing down. We got a couple 27's and 15 as well over the past week. Fishing is a bit slower but persistence is the key."